Interviews with citizens in Afghanistan, the Philippines, Zimbabwe, the Occupied Palestinian Territory, Mexico, and Ukraine, show that many of them had similar concerns: If I’m in danger of being robbed, is there a public security force that will protect me? If I go to a police officer, is he going to steal from me further? Is he going to abuse me? 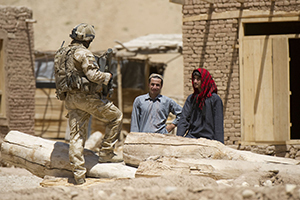 These perspectives were shared in a recent report on human security, co-edited by Kristen Wall. “Even though these are very diverse contexts, we found across the board that when you’re looking at security from the ground up, people most often are talking about their expectations or relation to the state, and primarily regarding rule of law and public services provision,” Ms. Wall said. States, however, look at security as a way to protect their borders and interests, though Ms. Wall says that doesn’t have to be in conflict with human security. “What we argue in this publication is that human security is not seeking to displace either the role of the state or the importance of national security, but rather it’s seeking to reframe the role of the state in providing security, so that national security is really in service to the security of the human beings living within the state,” she said. What does human security mean, and how does it differ from traditional understandings of security? Human security offers an opportunity to look at security from a holistic perspective—from the perspective of a human being, as we all are. It’s a very unifying concept of security. And as the UN Security Council resolution has stated, and in what we found in the interviews that we did in this publication, there are really three core dimensions of human security: freedom from fear, freedom from want, and freedom from indignity. What we did for this publication is go to local communities in very diverse contexts and ask: What makes you feel secure? When do you feel insecure? What factors protect you? What empowers you to act in self-protection or in protection of your community? Human security is an alternative way of looking at security from the national security paradigm, which seeks to protect the interests of the state and often is aimed at protecting the borders or the territory of the state. What we argue in this publication is that human security is not seeking to displace either the role of the state or the importance of national security, but rather it’s seeking to reframe the role of the state in providing security, so that national security is really in service to the security of the human beings living within the state. Ultimately, it’s the safety of individuals that is the end purpose of security. The idea of human security has been around for a while. Why did this report come about now? This is the 20th anniversary of the UNDP report that introduced the term “human security.” So the Global Partnership for the Prevention of Armed Conflict is doing a year-long campaign called “Human Security First” to bring this concept back to the fore. And also to bring it out of academia and elite policymaking circles—to give it new life by demonstrating what it means to real people. Human security is not necessarily a new idea, but it is a new synthesis of ideas. It’s also asking for the application of time-tested principles in a new field: the people-centered principle of human security is nothing new in economic development or in healthcare provision; we are arguing that actually applying it to the field of security makes security more effective—and sometimes more cost-effective as well. What did you hear from the ground? What were some of the commonalities? We looked at six regions—Afghanistan, Mindanao in the Philippines, Zimbabwe, the Occupied Palestinian Territory, Mexico, and Ukraine. Even though these are very diverse contexts, we found across the board that when you’re looking at security from the ground up, people most often are talking about their expectations or relation to the state, and primarily regarding rule of law and public services provision. This is also about women, in many contexts, asking “Who can I turn to? I can’t turn to the police because in some cases that might endanger my community. I can’t turn to my family. There are no traditional justice mechanisms that would take my concerns seriously.” So they have sort of a double lack of recourse. This ties into the strained relationship that we are seeing between the citizen and the state in so many parts of the world. How can human security also provide some solutions for that? That’s a great question. Just as citizens’ relationship with the state determines the state of their security in many cases, we also see that when citizens are able to constructively engage the state, or the state is able to constructively engage citizens, that together—and this is the key message of this publication—through state-citizen partnerships, you can collectively come up with better and more effective ideas about how to protect communities and reduce levels of violence, especially at local levels. The rule of law also comes out as one of the strongest, most important sources of human security for citizens from the ground up, so national security policies need to respect and preserve the rule of law in order to preserve human security. When security strategies undermine the rule of law, they are undermining human security in the long term. This happens because citizens are no longer able to access the system to protect themselves—the law, the courts, police officers. So you are losing the capacity of the system to protect, and you are losing the active engagement of citizens to protect themselves and people around them. So it really is about creating an accountable state. It’s creating citizens who are empowered and feel that they have a stake and a voice in government, and the effect is that there are more effective strategies for dealing with violence. What are the implications of this approach for the United Nations and international donors? International donors can play an important role in facilitating platforms—multi-stakeholder platforms—that bring state officials and civil society together to work on security issues so that the state’s interest in preserving public order can be met. But also citizens need to bring their information, their perspective, and in some cases to look for those strategies that will genuinely protect the community. The donor community can facilitate those types of forums. And you see in Zimbabwe, actually, there is information about the local peace committees, which the UNDP was very instrumental in setting up, which bring together traditional tribal leaders, political party leaders, and civil society groups to have local conflict resolution mechanisms. And police officers in the community have commented on the reduction in violence since the local peace committees have been done. So that kind of programming can be very helpful. Also just stressing the importance of evaluating security policy based on the impact that it has on communities and citizens, and really asking: What is the impact of militarized security on access to water, access to the environment, to education, healthcare infrastructure, what is the “collateral damage” that’s done from a human perspective? So human security is looking at the full picture of human security, the holistic picture of human security. Importantly, the Guatemalan justice process appears to have the full backing of the UN and members of the international community. The South China Sea Code of Conduct: Another Prelude to Action? A mechanism to uphold the rule of law in the South China Sea has consistently been the standard that ASEAN members have demanded of China; it has been just as consistently rejected by Beijing.